You always expect a bit of chaos and calamity during the Brazilian Grand Prix, but this weekend was something both brilliant and awful in equal measure. Rain delays, safety car periods, red flag stoppages and quite a few crashes meant it was a long, long, long race. But alongside that, there was some incredible driving on display and some great atmosphere in the crowd (both positive and negative). The championship did not come to its conclusion at Interlagos today but at every point it felt like it could have gone either way, so read on to see how it all unfolded with the Factbyte Factbox lap by lap coverage. Hi there, how are all the FBFB friends and fans out there? It's been a while but we're all quite excited about the Brazilian race (it's wet!) so here's an impromptu live coverage for ya! I was reluctant to do this, actually, the moment I saw Romain Grosjean spinning off track. Everyone's favourite French driver (right?) had a huge grid position in 7th, but hit a damp patch on an outlap and aquaplaned into the wall. So I am sulking a little bit. The start of the Brazilian Grand Prix will be delayed by 10 minutes. Hopefully they're delaying it to avoid a safety car start, so that's a good sign. Max Verstappen has been complaining that his grid box is situated directly over the chequered flag line - and that it might be quite slippery off the start. His rear wheels are directly on the paint, although it's supposed to be non-slip, but I'm sure no one has faith in that. Mixed reviews about the possibility of a safety car start. Pérez and Bottas favour a standing start, whilst Verstappen would prefer to get underway behind the safety car. As we are all aware, the championship is at stake in Brazil today. Hamilton is 19 points behind leader Rosberg, and needs a race win this afternoon. However, if Rosberg finishes second, it's all over anyway! Rain is predicted to continue for about an hour into the race - depending on when it gets underway, of course. The race will start behind the safety car. Team radio to Marcus Ericsson, 20th on the grid: "Rainfall decreased slightly but it will remain for at least the next thirty minutes like this." Rosberg's getting some detailed information about Lewis Hamilton's race setup ahead of getting underway. I think everyone's a bit nervous about these conditions now. Felipe Massa has a special livery on his car today, with his name plastered along the side. He's celebrating his final home race and his penultimate grand prix as he'll retire at the end of the pitlane. I did a bit of a collection of Sidepodcast's love for the Brazilian driver. Everyone has to start on the full wet tyres due to the safety car, so it's a free choice of compounds throughout the afternoon, no requirement to use two compounds. It's the third time this season that a race has started behind the safety car. 44 laps led by the safety car in 2016. Pesky rain! Race started behind the safety car. Hamilton complains over the radio that he can barely see behind the safety car, so he's dropping back a bit. Team radio from Daniel Ricciardo: "Exit to the last corner is worse than on the lap to the grid, it's probably the worst part of the track." Hamilton slowed right up for a moment there, backing the drivers up into each other, but no contact luckily. Thoughts after a lap from Max Verstappen: "It's a bit wet." Tweet from @RenaultSportF1: "Two laps in. Kev, what do you think of the conditions? ""I think it's ok!"" 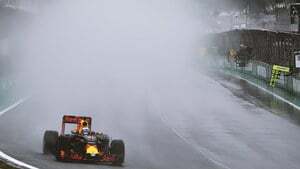 Team radio from Carlos Sainz: "Ehhh, It's possible to race but on the limit, visibility on the limit." Mechanics are out in force in the pit lane, clearing the pit boxes of water wherever possible. There are a variety of strategies going on in the pit lane, some teams have brooms, others have gone for the air blowers to try and dry the pit boxes. Fastest lap for Pascal Wehrlein, 1:58.407. Just putting it here because, you know, when else will it happen? Team radio from Jenson Button: "The biggest problem is, if somebody loses it in the last corner, you can't see anything." Meanwhile, Kevin Magnussen says he's ready to get going. Verstappen also keen to start, saying the only problem is the spray. Hamilton is complaining that a lot of water is going in his helmet, at the top of the visor. Safety car coming in this lap. Hamilton stormed away and got a great start, Rosberg followed him safely. Verstappen caught Räikkönen napping and easily moved ahead for third place. Kevin Magnussen has gone into the pit lane and taken on intermediate tyres, that's an incredibly brave gamble! Max Verstappen looks full of confidence in these conditions, he's now moved up behind Nico Rosberg and is starting to look for a way past. Meanwhile, Hamilton sets the fastest lap time so far. Team radio from Daniel Ricciardo: "Okay, let me know anything that will get me out of this spray." Jenson Button has also come in for the intermediate tyres. At the end of the ninth lap, several drivers have dived into the pitlane, and it is intermediate tyres going on all the cars. Seems like it was a good call from Magnussen. Williams double stacked their drivers, Bottas headed out first and Massa moved in behind. Slight delay on his stop but great work by that team! It was Alonso, Bottas, Magnussen, Kvyat, Massa, Palmer and Ericsson who all came in for those green striped tyres. Rosberg is informed that some have taken on the other compound but he says "No way, too early." Sebastian Vettel spins onto the grass, and sits in the middle of the track, facing the wrong way. That was a heart-stopping moment, the exact worst place to stop, but he recovers and heads straight into the pit lane from that awkward position. There's a problem with the left rear tyre on Vettel's car, so it's a slow stop for him as well. Disastrous couple of minutes for the German. Felipe Massa and Esteban Gutiérrez under investigation - overtaking before the safety car line. Ericsson is running along track with a front wing missing! And he's blocked the pit entrance! Ericsson must have hit the wall, there's debris across the track. Meanwhile, Verstappen has managed to get into the pit lane for a stop, but had to avoid the Sauber who was diagonally across the track. How did he get in there and could he be in line for investigation for that? Tweet from @SauberF1Team: "'Sorry, aquaplaning...' - Marcus is out of the #BrazilGP #F1"
Hamilton checks whether it was someone on intermediates, and is happy to confirm that it was, so his decision to continue on full wets is the right one for now. There was a race control message that the pit lane was officially closed, but it's hard to tell whether Verstappen was already in there or not. Ricciardo followed him in, so he will definitely be in trouble. The mechanics are recovering both the stricken Sauber and the front wing that it left behind. And Ericsson has hitched his lift back to the pit lane. Verstappen has taken on the intermediate tyres, and is sitting in fourth place. Ricciardo did the same, and is ninth. Free pit stops for them, but are they the right tyres? There's more rain expected any time soon, so concerns for the intermediate tyres must be growing. Replays show one of the Force India drivers, Pérez I think, having a bit of a wobble at that treacherous final hill climb. Nine drivers remain on the wet tyres, the rest are on intermediates, and of course we have two retirements so far. Incident involving Daniel Ricciardo under investigation - entering the pit lane when pit entry closed. Jolyon Palmer is back in the pit lane, now down in last place, and he's put the full wet tyres back on after a brief stint on the inters. Räikkönen spins on the main straight, hitting the wall and then spinning across track to hit the other wall, ending up facing the wrong way. Hülkenberg drove straight across the front wing that came flying off Kimi's car. All the cars are heading back into the pit lane, as they can't stop on the grid due to the recovery of the Ferrari and all the surrounding red debris. Räikkönen climbed from the car immediately, waved to the crowd and hopped over the pit wall to head back to the garage. Thankfully unharmed. That was another moment where a Ferrari was facing head on into the incoming traffic, terrifying but everyone okay, thank goodness! Team radio from Sebastian Vettel: "Honestly, this is just mad. This is just stupid. Red flag. We need extremes first of all, second we need to stop the race. It doesn't work. How many people do you want to crash? I nearly crashed into Kimi in the middle of the straight. I couldn't see anything!" The tractor is out on the main straight to recover the car, and the drivers are in the pit lane out of their cars whilst they wait. Hamilton takes a wander through the Manor garage, looking a bit lost as he makes his way out the back. Tweet from @GaryLineker: "Not a frequent watcher of F1 but in this rain it's compelling viewing. Courageous buggers!" Hamilton is making the most of this red flag period, getting the helmet technician from Bell to replace the visor on his helmet that was letting water in. The two Manor drivers are currently up in the top ten, having not technically come in for a pit stop yet. Of course at this point, people are starting to talk about half points, Sky F1 are just pondering how far the race can get given that there's a two hour race deadline. It's the end of lap 53 that would give us full points, so we're almost halfway there. Tweet from @RenaultSportF1: Bad news for Jo, an incident at the same time as Kimi's wall hugging has caused some damage. We're checking it out. 5 second time penalty for Felipe Massa - overtaking before the safety car line. 5 second time penalty for Daniel Ricciardo - entering the pit lane when pit entry closed. Romain Grosjean: "For me hero to zero in less than 24 hours. I feel so bad for the team, for the boys, we had a good starting position. I don't know, I was just doing laps to the grid, going up the hill, not even flat out... I don't know what happened, I've seen two other cars having the issue, we need to improve the wet tyres. It shows that the extreme tyres are poor, there's no grip." Kevin Magnussen having a sit down in the Renault garage, looking quite relaxed but equally anxious to get going again. Marcus Ericsson: "I'm fine. It's tricky out there, it's a bit strange thought because in the corners it's fine, there's a lot of grip. Where there's no standing water it's all good. Where there's standing water and a lot of spray, it's extremely difficult. You can lose it going in a straight line more or less. I think both inters and ex-wets, I don't think it makes a difference because we've seen cars on both losing it on parts of the track." Race will restart at 15:21. All cars must have extreme wets fitted at race resumption. Tweet from @RenaultSportF1: Update on Jo: it was a touch with Kvyat that caused the damage. We're still working on the car. Today of all days, you never know! Drivers are getting strapped back in their cars now, prepping for the restart and getting back in the zone. Teams have been allowed to change certain bits and bobs on the car, and make repairs where necessary, so it's almost like starting from a clean slate when we get racing again. Ted News: It hasn't rained for ten minutes but now it's just started again. It will be a safety car restart and it'll be doing more than one lap. Safety car leads the pack away, so we're off and running again, sort of. Pérez's engineer informs his driver that there's fifty minutes of rain coming. Jolyon Palmer didn't get going again, so whatever repairs Renault were trying to make to their car, they couldn't complete them in time. Hülkenberg heads into the pit lane after one single lap behind the safety car, he takes on a new set of full wets and heads back out again. A right rear puncture for the German driver. "Oh really? Jesus, okay." Hülkenberg said over the radio. He's down in 15th place now. Team radio from Nico Rosberg: "Still very difficult, still a lot of water." I don't think I've ever seen Toto Wolff look quite so serious and stressed, even at the height of the inter-team driver battles! Sebastian Vettel still concerned about the state of the track, and tells his engineers so. He's currently down in 14th place after his earlier spin. Replays show the collision between Palmer and Kvyat. On the main straight, Palmer was following the Toro Rosso, mistimed his braking and hit the back of Kvyat. He broke the front right wishbone on his Renault. Back in realitime, Max Verstappen accidentally went past Rosberg and then had to slow right down to drop behind again. Sergio Pérez behind him had to slam on the brakes to avoid him. Team radio to Max Verstappen: "Max you cannot pass the Merc. Understand he braked pretty aggressively there, but make sure you stay well behind." Booing from the crowds, as they sit under their ponchos only to find the action being called to a halt once again. Team radio to and from Hamilton: "Red flag, red flag." The drivers are filing back into the pit lane. Most of the drivers looking a bit baffled at the stoppage. We're not all that much nearer to the 53 laps mark, so still at half points as it stands. Cars are still running to burn up fuel that they won't need now the race has had so many safety car laps. From the comfort of my chair, it does look like it's a lot clearer now. Race will restart at 16:02. All cars must have extreme wets fitted at race resumption. Bit of deja vu here, but drivers are getting strapped back in their cars again and... yep, it's raining again now. Jolyon Palmer: "I could see nothing, I came out of turn 12, I had better grip than the guys in front on the full wet tyre. I was guessing where the kinks in the road were going, I didn't really know. I knew I was getting a run on Daniil, went to the inside and I hit him. I think I hit him, and I only saw him as I hit him." Team radio to Nico Hülkenberg: We're predicting this level of rain or heavier for the next fifty minutes. We're predicted a time limited race." Safety car leads the pack away again, and it's confirmed it will do more than one lap. Hamilton backs the pack up as the safety car pulls in for the restart. Verstappen has closed up to Rosberg already, he brakes late into the first corner but hasn't quite got the pace yet. It's a clean first corner, we're still racing, this is amazing! Verstappen had a better run into the corner and stormed his way past Rosberg to move into second place - a crucial move for the championship! The Red Bull driver went alllll the way round the outside of turn three in an incredible move. He's now chasing after Hamilton. Daniel Ricciardo is looking feisty against the Toro Rosso of Carlos Sainz, and he's made it past to move into fifth place. Pérez is catching up to Rosberg as well, the second Mercedes not looking comfortable yet. Sebastian Vettel takes to the inside of Pascal Wehrlein, overtaking the Manor to move into the top ten. Never thought I'd see a Ferrari versus Manor battle for actual position this year! Felipe Massa and Jenson Button have both come into the pit lane to put on the intermediate tyres at this very early stage of the restart. Team radio to Kevin Magnussen: "Talk to us about these conditions, Kev." "Leave me alone for a bit." Max Verstappen sets the fastest lap of the race so far. Wehrlein is really struggling now, with Valtter Bottas and Nico Hülkenberg both easily getting past the Manor driver. Lewis Hamilton grabs the fastest lap back from Verstappen, a 1:25.693. Tweet from @ForceIndiaF1: Amazing job by Nico - he clears MAG at turn 1 and WEH at turn 3 to make up two places in sector 1 alone! Vettel has another Manor in his way now, as the Ferrari driver sweeps past Ocon who runs wide and concedes the position. In the Sauber versus Manor championship battle, we've now got Nasr in 7th and Ocon in 10th. Button complaining that it doesn't matter which tyre he's on, it's not working for him. Max Verstappen spun in second place, and narrowly managed to keep his car out of the wall. Rosberg closed in and moved alongside but the Red Bull stays ahead. For now. Incredible save from Verstappen, as we see the replays. "My heartbeat went a bit higher then," he says over the radio. Daniel Ricciardo has steered his way into the pit lane and he takes on the intermediate tyres as well. He's held a bit longer for the 5 second penalty handed out earlier. Meanwhile, out front, Hamilton is starting to concern himself about the wear on his tyres, he's told to search out wetter sections of track. Kevin Magnussen is the next driver to come in for the green stripes. Vettel is searching this way and that to get past Alonso, and he makes it stick on the inside, although the McLaren doesn't want to give up the position and ends up running wide off track. Ricciardo sets the fastest lap of the race so far - 1:25.532, on his intermediates. And in response, Max Verstappen heads into the pit lane. Tweet from @ManorRacing: Dear VET & ALO. Just concentrate on getting past NAS. Please. Replays show Ocon complaining that the Force India of Nico Hülkenberg pushed him off track as Nico was getting past. Vettel does make it past Nasr for sixth place. Team radio from Jenson Button: "I need to come in for another set of full wets." "Jenson, other drivers are going to inters." Replays show Nico Rosberg having a huge wobble at the exit of turn 12, same as Verstappen although slightly less dramatic. He's dropped back to 18 seconds behind Hamilton, who is given a warning to be careful through that corner. Button has come into the pit lane, but he's had to take on a used set of wets, as they only get three sets per race. This is his fourth stint on wets. Safety car as Felipe Massa is sitting just at the pit lane entry and missing a front wing. The pit lane entry is closed once again. Massa climbs from the car and gives the crowd a huge wave - a disappointing end to his final home race. Big cheers for Massa as he waves to the crowd and makes his way back to the pit lane. He looks quite emotional about the whole thing, bless him. Massa taking the long way back, with a Brazilian flag waving behind him. A tractor moves in to recover the Williams as the drivers slowly pass through behind the safety car. One of the nearby marshals is in tears at Massa's disappointing end to the race, but no one is judging the Brazilian driver at this point. Amazing scenes as all the mechanics from all the teams are lining up to cheer Massa on as he makes his way back to the Williams garage. His wife and son have come out to give him a big hug too, lots of tears from everyone. Whilst Massa is making his way through a line of clapping Williams mechanics, the pit lane has actually opened and the backmarkers are overtaking to clear the way for the safety car to come in. Daniel Ricciardo comes into the pit lane and its full wets going on that Red Bull. Team radio from Lewis Hamilton: "The safety car, man, it's so slow today. I'm struggling to keep heat in the tyres." We've reached the full points mark, so that's a relief. There's just over 25 minutes of race time left, so it's unlikely we'll see all the laps completed. Rosberg, in second place and a championship winning position, is quite naturally complaining about conditions and urging them to end the race. It's raining harder again now. Verstappen says he can't do anything on his intermediate tyres. Verstappen comes into the pit lane for full wets, that was a bad call earlier by the team. Saftey car in this lap. Once again, Hamilton backs the pack up for the restart. Hamilton gets away well but not quite as far ahead as previous restarts, Rosberg has stayed with him this time. Replays show Fernando Alonso having a spin off track at that difficult final corner, and he's dropped back to the rear of the field, 17th place. At the moment, we just have Valtteri Bottas in 11th and Kevin Magnussen in 16th on the intermediate tyres, it's full wets for the rest of the field. Max Verstappen drives past Bottas as though the Williams was standing still, the intermediate tyres on the Williams dropping off very quickly. Bit of a Red Bull traffic jam now, as Kvyat is in front of Ricciardo, who leads Verstappen. Verstappen has got ahead of Ricciardo, and the Australian drops back drastically. Max heads straight up to chase Kvyat. Hülkenberg goes round the outside of the Sauber driver, a clean move to take sixth place. Verstappen sweeps past Kvyat, to put the Toro Rosso driver between him and his teammate. Verstappen is on a mission right now, he quickly dispatches Ocon. Gutiérrez is out of the car, in the garage, he looks angry. He slammed his gloves into the floor of the garage in rage. Verstappen overtakes Nasr as well, up into seventh place by moving alongside and just braking later than the other driver. "The next one is Hülkenberg," his engineer informs him, as Verstappen sweeps his way up the top ten. Sainz is now defending from Vettel, pitting an old and a new Ferrari engine against each other. Sainz runs a little wide but keeps the German behind him. As instructed, Verstappen sweeps past Hülkenberg. Vettel is next in line. Verstappen pulls alongside the Ferrari of Vettel and tried to hold on round the outside but Sebastian kept his foot in to hold the position. Incredible moves from Verstappen, he takes to the inside of Vettel and immediately chases down his former teammate Sainz. Fourth place for Verstappen now, but Vettel is complaining the Red Bull driver pushed him off track. Sergio Pérez is sitting in third place, but Verstappen is absolutely flying, and is within a second of the Force India already. Three laps to go, that's a lot of defending to ask of Pérez. Wow! Verstappen and Pérez go side by side through several corners and the Dutchman just will NOT give up. He sticks it out and takes third place. Rosberg's second place finish means that the championship battle will go on to the final round of the 2016 season in Abu Dhabi. Max Verstappen finishes an incredible third place. Sauber do manage to get ahead of Manor in the championship, with Nasr picking up ninth place, and Ocon just missing out on the top ten as Alonso got ahead of him for the final points position. The crowds are cheering again now, because although it was wet and delayed and bonkers, there was some great racing tucked away in there, and we finally got to the end. Great job. Fastest lap for Max Verstappen on lap 67, 1:25.305. Six retirements as well. Ragey Gutiérrez, emotional Massa, almost invisible Palmer, spinny Räikkönen, crashy Ericsson and before-the-start Grosjean. Podium green room atmosphere - bit frosty between Rosberg and Hamilton, but lots of chatter between Lewis and Max. Verstappen has the biggest smile I've ever seen, that's a man who knows he's done a good day's work. Trophies on the podium and champagne to follow. I don't know about those boys but I am absolutely exhausted. That was the worst and the best race I've seen. Two weeks to go until the championship finale in Abu Dhabi, it will be nothing like this weekend but it will be superbly important. Will you be watching?